Discussion in 'Z3 Roadster & Coupé' started by smartbear, Sep 25, 2014. So................. I guess that's answered the one about which car lives in the garage then. How does it secure so that the wind doesn't get under it please? Rough idea of cost too, pretty please. Hi tony, the cover has fleece enclosed magnets round its circumference & also has rubber flanges that close in the doors/boot so it can't easily be stolen-it cost £170 including postage. Hi thanks for that. I guess I jumped to the wrong conclusion after all then. Ha Ha.. 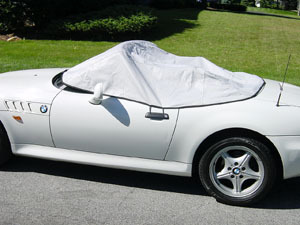 I think that I will probably get a cover when I get a new soft top. I have their Interior Cover in tan Weathershield fabric to match my interior. It's like a tonneau cover, and very thin and light so it wads up into a small bundle for storage. It is held by the trunk, the door handles, and the wipers. The link that I posted, http://www.roadstersolutions.com/page3.html, says it does. My car does not have roll hoops, and I think the cover would fit better with less slack if I did have roll hoops. Who was the vendor for that cover? My tonneau cover from Roadster Solutions does not touch much paint. I can't imagine how paint damage could occur, particularly since this is just a convenient tonneau cover used for short periods of time. I know storage covers can damage the paint, from long term use, trapping moisture, flapping in the wind, etc. I personally think it was not used correctly, or just left on over the whole winter. They looked at taking legal action against the seller. I like it, however it makes the Zed look like a hooded falcon [the winged variety].